Walter F. Ulloa is the Chairman and Chief Executive Officer of Entravision Communications Corporation, a diversified Spanish-language media company utilizing a combination of television, radio and digital media operations to reach Latino consumers across the United States, as well as the border markets of Mexico. Entravision owns or operates 58 primary television stations, with television stations in 19 of the nation’s top 50 Latino markets, including Washington D.C., and is the largest affiliate group of both the top-ranked Univision television network and Univision’s Unimás network. The company also owns and operates one of the nation’s largest groups of primarily Spanish-language radio stations, consisting of 49 radio stations, and a robust digital media business. Entravision shares of Class A Common Stock are traded on The New York Stock Exchange under the symbol: EVC. With 30 years of experience in Spanish-language television and radio in the United States, Mr. Ulloa has held his position as Chairman and Chief Executive Officer of Entravision since its inception in 1996. From 1989 to 1996, Mr. Ulloa was involved in the development, management and ownership of the predecessor entities to Entravision. Mr. Ulloa was appointed by President Obama to the Board of Trustees of the John F. Kennedy Center for the Performing Arts in Washington D.C. Mr. Ulloa is a member of the Board of Directors of the Los Angeles Music Center and the LA84 Foundation. He is also a member of the Board of Directors of La Plaza de la Cultura y Artes and recently joined the Board of Directors of the US/Mexico Foundation. 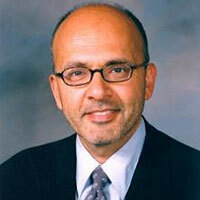 Mr. Ulloa is a graduate of the University of Southern California (1970) and Loyola Law School in Los Angeles (1975). Mr. Ulloa lives with his wife Alexandra Seros and son Bruno Seros-Ulloa in Pacific Palisades, California. Alexandra Seros is an accomplished screenwriter. His son Bruno is in his fourth year at Cornell University.